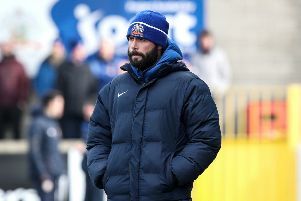 Third-placed Glenavon moved six points clear of Linfield in the Danske Bank Premiership tonight with a 2-0 win at Windsor Park. A goal from Josh Daniels and a deflected Mark Griffin strike secured the three points for Gary Hamilton’s men. To launch the gallery from tonight’s match, click on the link above.